Charles from The Dadsons;only passed his driving test about a year ago and had never driven on a motorway. His dad however trusted him implicitly and was more than happy to let him do a lot of the driving particularly on the mountain passes. A definitely proud dad! At Tuesday morning’s briefing everyone was again treated to a festive atmosphere with Father Christmas and his team of helpers, Elf, Snowman and Grinch distributing Christmas Crackers and Christmas Cards to their fellow Motoscapers! They continued to entertain as they left the hotel with their Christmas lights flashing and music playing, much to the delight of the hoteliers and other guests. 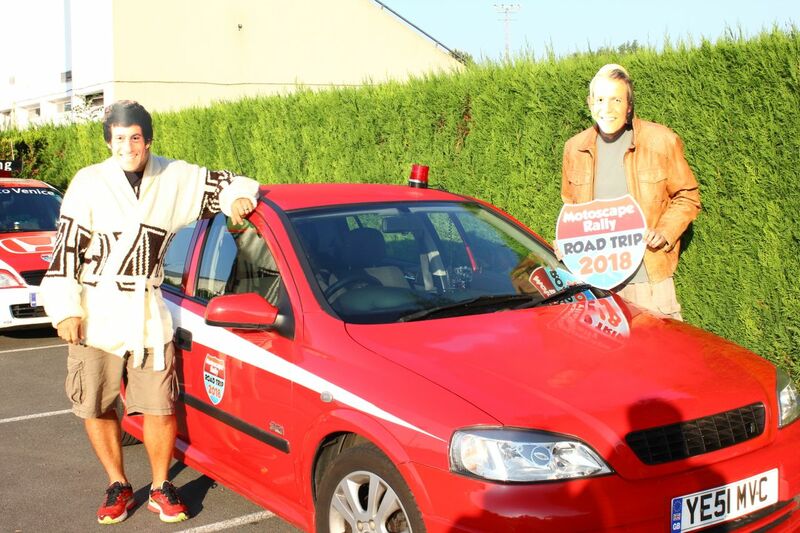 It hasn’t been a trouble free ride for Mark and Chris from Grumpy Grandads on Tour. They failed to make it to Garmisch Partenkirchen after their car broke down. A new distributor cap was needed but the breakdown company were unable to fix it, forcing them to stay overnight in Ulm. The Clatters were happy to help, and very kindly offered to give them a lift if they could get to Garmisch, and then let them continue to Prague, in the car they had intended on scrapping in Venice. 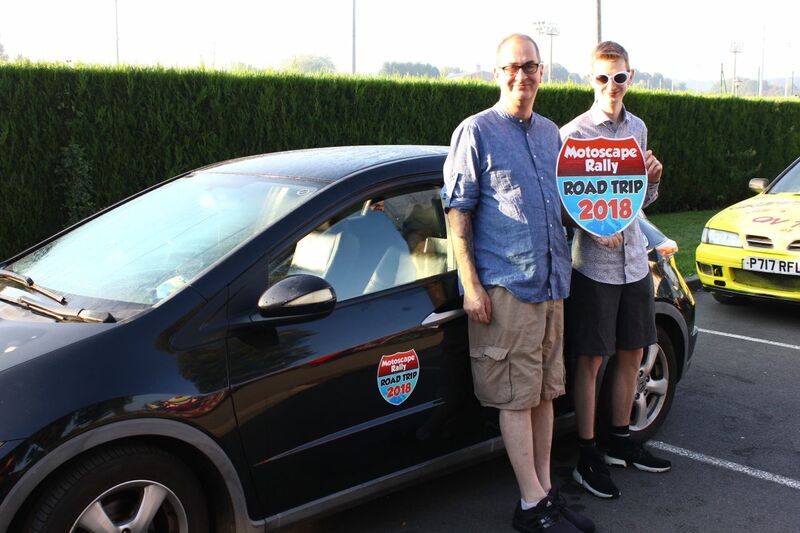 This is what we love about Motoscape Rally – Motoscapers are so helpful and friendly towards each other :-) We shall wait and see if Mark and Chris manage to get their car fixed, watch this space. On leaving Garmisch Partenkirchen, teams: Scooby Ecosse, Goldmember, Safety Car Boys, Comic Interlude and Driving Home for Christmas all decided to visit the site where the film ‘Eddy the Eagle’ was shot. The Good Ol Buoys came upon workmen resurfacing a road and found themselves directly behind the resurfacing machine. After being waved through they travelled a short distance before glancing back in the mirror and noticing that they had left two inch deep tramlines in the newly laid tarmac, whoops! 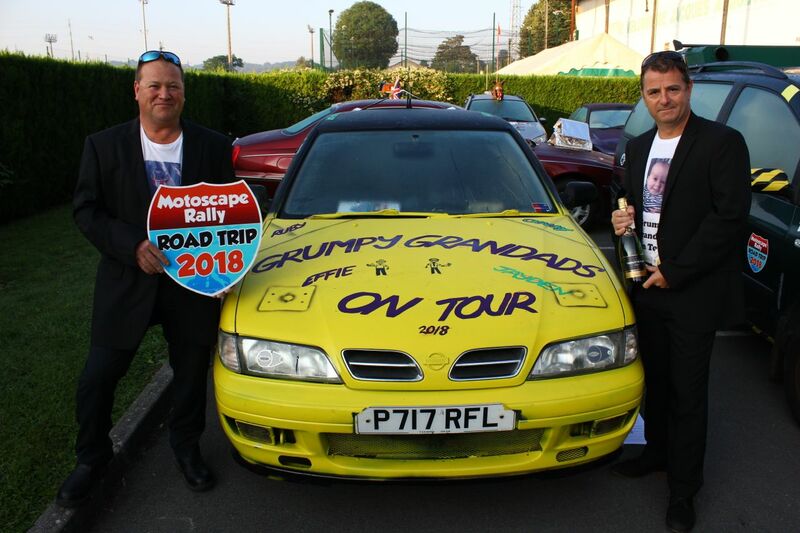 Matt and Dudley from Team Scrumptious decided to take in three passes. Dudley is on his second Motoscape adventure and to most people he is just another participant enjoying a road trip through Europe. Dudley however is blind in one eye and has tunnel vision in the other, due to a brain tumour. We know he has been itching to get back behind the wheel so what we want to know is did he, or didn’t he, jump into the driver’s seat and negotiate those mountain passes. Dudley wants everyone to know that no matter what happens you should always be positive and don’t let disabilities prevent you from doing the things that you really want to in life. Hats off to Matt for making it all possible! The Stelvio Pass presents a tick off the bucket list for many teams. The Dadsons, Scooby Ecosse, The Kings of Leon, Probe-ably Bust, Good Ol Buoys, Motorsport Maniacs and Wolf Miners, to name but a few, all took to the bends. 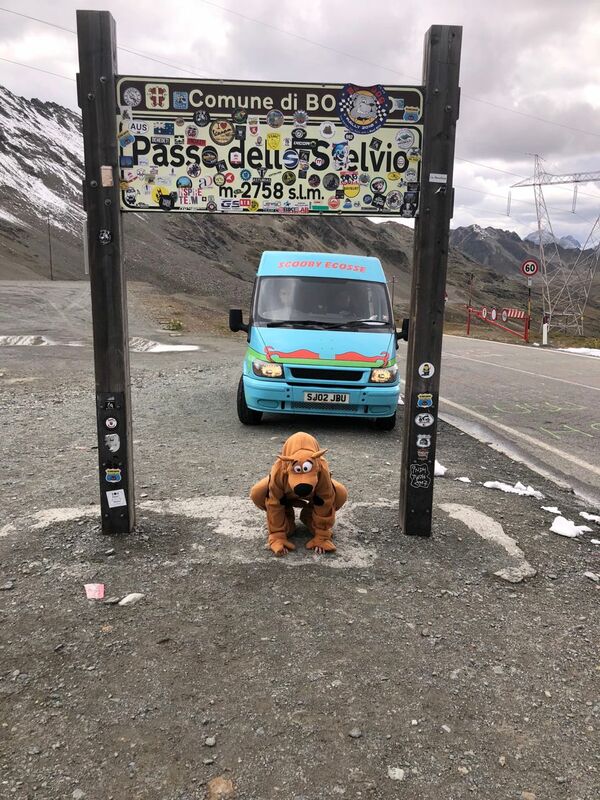 Lilli (aka Scooby) from Scooby Ecosse was delighted to find snow at the top of the Stelvio and took great pleasure in throwing snowballs at her team mates (her parents!). Brothers Nick and Sam from Motorsport Maniacs, stumbled across a traditional gelateria in a village at the bottom of the pass and wisely chose to wait for a quieter time later in the day to experience those hair pin bends. A couple of teams decided to also take in the Gavia Pass. The Good Ol Buoys described the steep drop offs without safety barriers as rather unnerving. The Bacon Bap Bandits whilst traversing the pass, came across an accident where a car had crashed into a wall on a bend. Paramedics Garreth and Noel dutifully stopped to see if they could assist and found a very distressed foreign couple. The woman had lacerations to her head which they managed to glue and after checking out their minor scrapes calmed them down. They then helped them get their car moved and back on their way. Bacon Bap Bandits, the unsung heroes, continued their journey without further incident. Mark and Majula from team M&M Asian Fusion had a bit of a nightmare. Mark was keen to cover three passes, the Timmelsjoch was completed without a problem but it was a matter of bad timing on the Jaufen Pass. A boulder had fallen onto the road which then had to be closed. A long wait ensued as it was 3 hours before the pass was reopened. At least they managed to complete two of the passes. 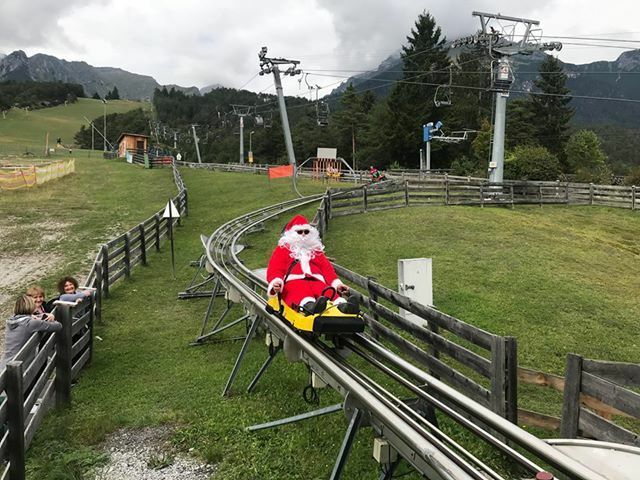 The Adrenalin junkie teams headed for the alpine rollercoaster at Imst, they were to name but a few: Driving Home for Xmas, Jurassic Prague, International Rescue, The Dadsons, Probe-ably Bust, Scooby Ecosse, Motorsport Maniacs and The Wolf Miners. Clayton from the Wolf Miners managed a fast, exhilarating ride with no braking which made up for his slower ride the day before! Deidre from Scooby Ecosse was encouraged by Gill to give it a go and had great fun and lost her fear of rollercoasters! Whilst approaching Rovereto, Driving Home for Christmas got quite a shock when they were pulled over by the Italian police after causing quite a spectacle with their costumes, flashing lights and music. Santa Claus was tested for drugs and alcohol but the only thing they were carrying in their car were mince pies! 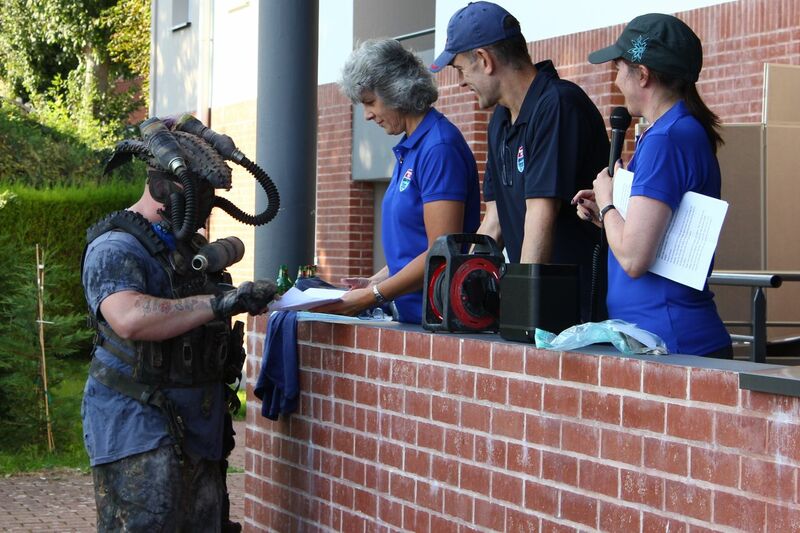 They were faced with a fine of 400 euros at first, but after chatting and explaining they are on the Motoscape Rally and raising money for charity, the policeman allowed them off with a fine of 28 euros instead!